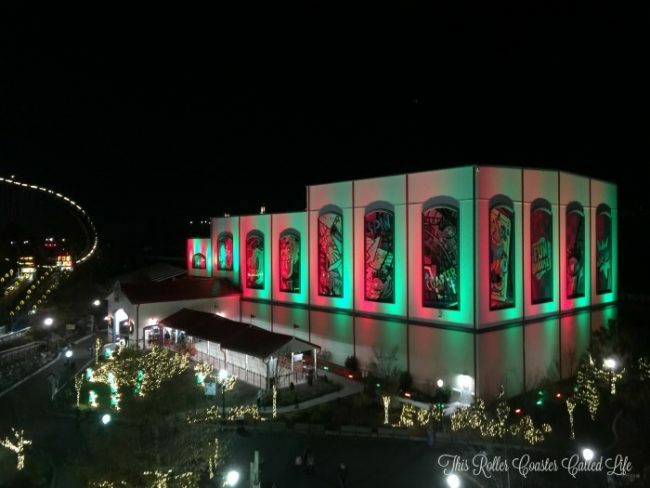 We are all fans of Hersheypark, but there is something special about Hersheypark and the holiday season! We’ve been during the holiday season more times than I should probably admit, including last night, but it is so beautiful with all the lights and festive charm that only Hershey can exude during the holidays. 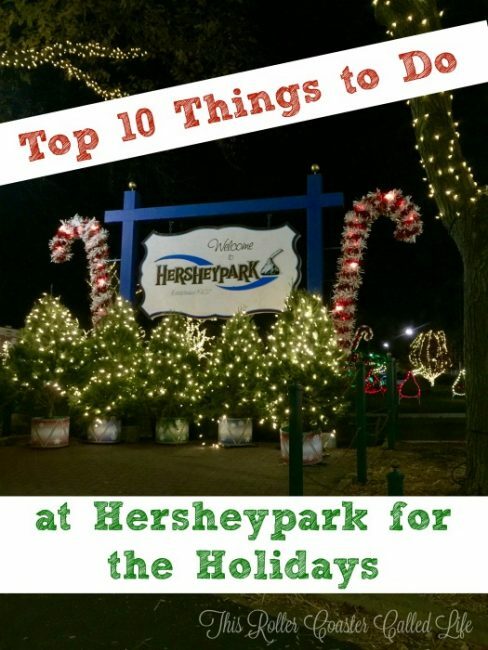 And yes, that includes being able to find some chocolate and hot chocolate… Check out our 10 top things to do at Hersheypark for the holidays! My kids have finally decided they are too old for a photo with Santa… BUT for most young kids, Santa Claus is at the top of the list. I mean, after all, we must make sure that Santa knows exactly what they want for Christmas! 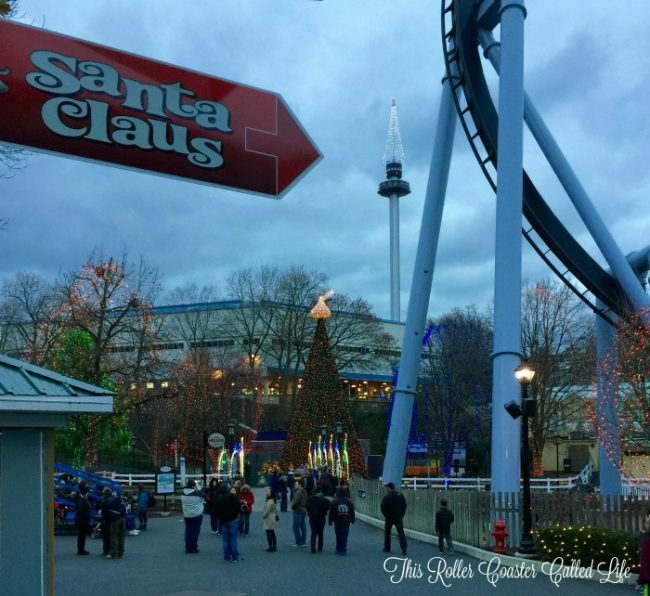 What a better place to meet with Santa Claus than at Hersheypark! 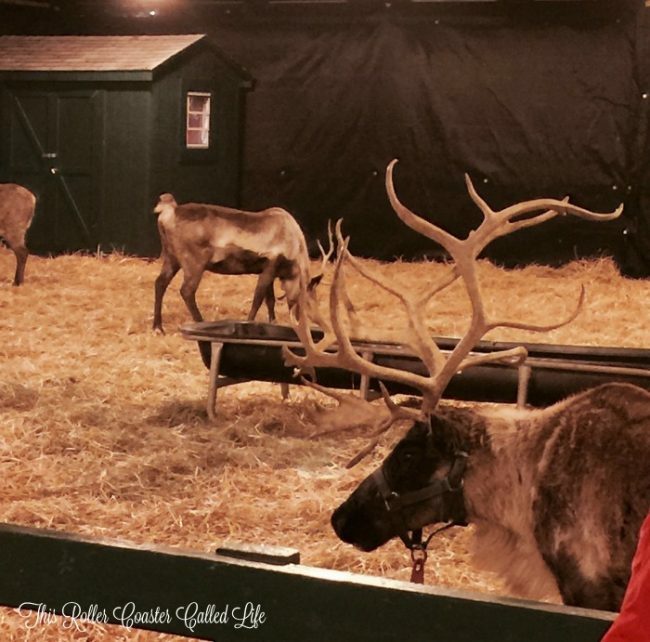 Then, you can head over to the other side of the park and see Santa’s reindeer. I love to see the reindeer every year! The people who work with the reindeer always have some tidbit of information about reindeer that I didn’t know. Make sure you find Rudolph in the herd! 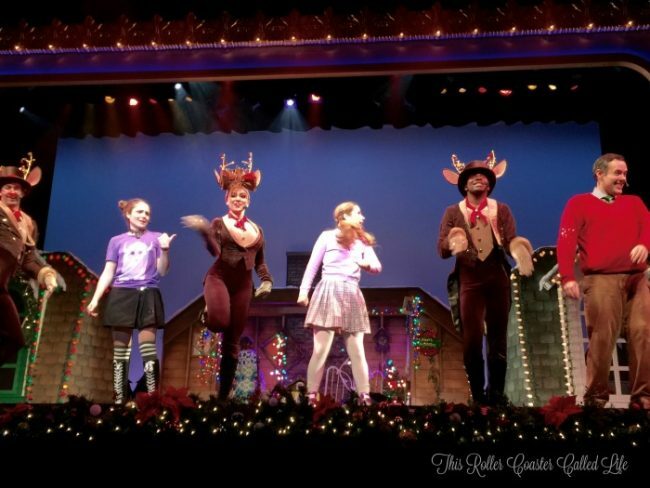 A Music Box Christmas is indoors at the Chevrolet Music Box Theatre. It only lasts about 40 minutes, but it is jam packed with Christmas songs in a cute story about the magic in your heart. Songbird and I liked it so much that we took Don and Marvel Boy back to see it last night. 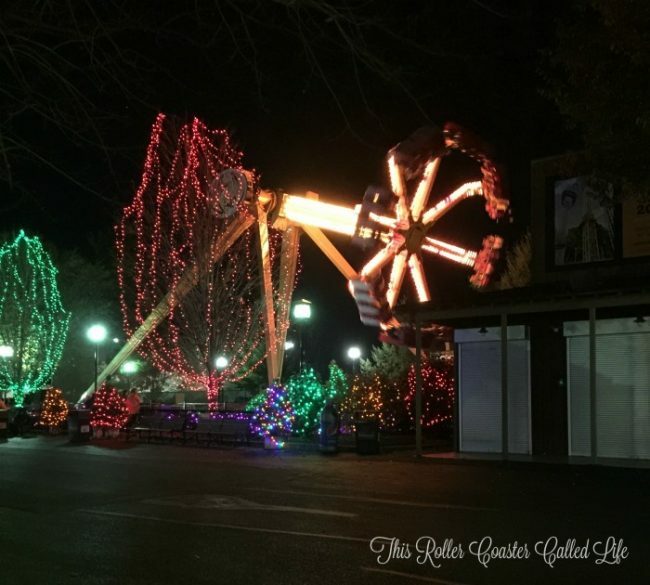 It certainly is festive to ride some of the Hersheypark rides with all the Christmas lights everywhere! There are many rides open including some of the roller coasters (seasonal ride list here), but just keep in mind that safety is of the utmost importance at Hersheypark. If it is too cold, some of the listed roller coasters will not be able to run. However, there is one roller coaster that is immune from the cold… Laff Trakk is an indoor coaster, and it has a holiday overlay! The large light Christmas tree inside the ride was truly stunning while spinning around it last night! 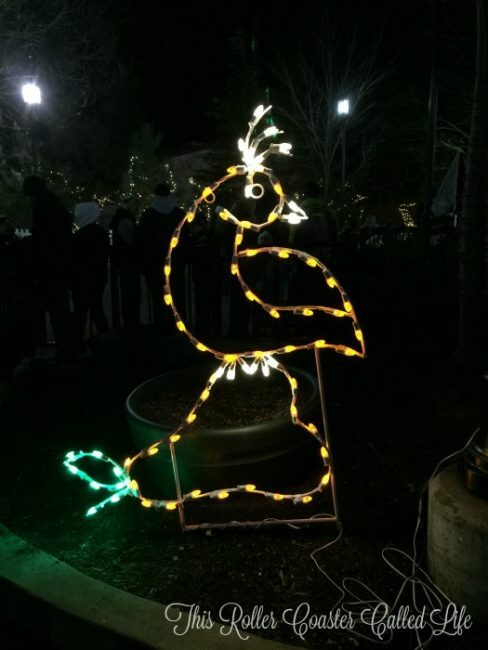 NOEL is a musical light display at Hersheypark. The lights in the area flash on and off in time with the music. The shows are every half hour starting at 5 pm. If you like lights and Christmas music, this is something that is not to be missed! If you want to see NOEL from a different angle, try to time your ride on the Skyview to correspond with one of the NOEL performances. We did this a couple of times this season, and it was a relaxing way to view the lights and hear the music. So, Hershey IS chocolate! Of course, there would be hot chocolate and s’mores options. We are season pass holders, so we purchased the season pass holder mug early in the season. 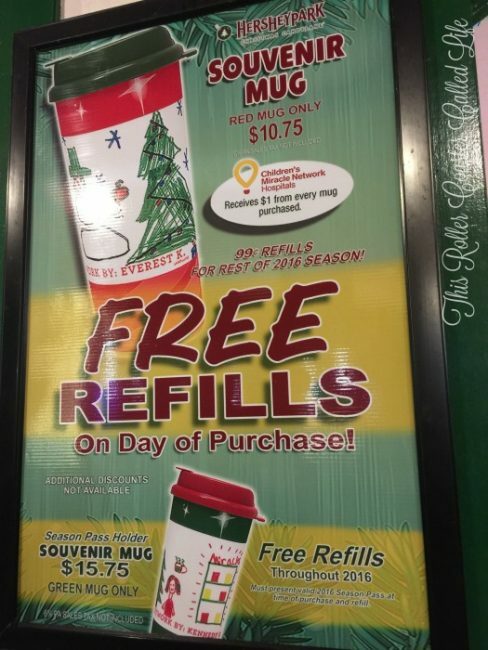 With this mug, we were able to get FREE refills all season long. [I will not admit to how many mugs of hot chocolate I have had since the holidays began…] If you are not a season pass holder, don’t despair! There is an option for you at the top of the photo that includes FREE refills on the DAY of purchase. When you get your hot chocolate, don’t forget to pick up a s’more! 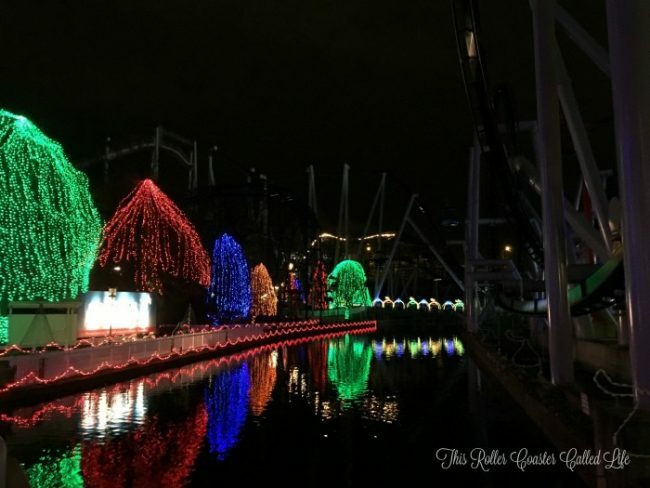 Hersheypark has the 12 days of Christmas in light displays. It is fun to go around and find all of them! In fact, we watched a someone taking a picture with one of the golden rings. It looked like she was trying to send a hint to someone. 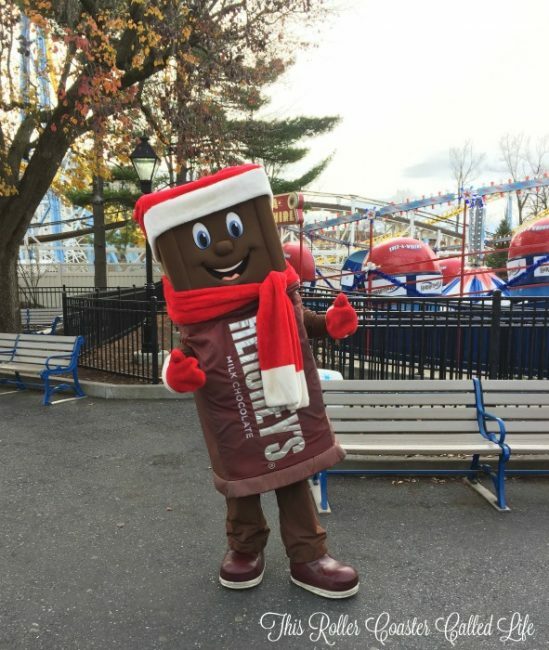 The Hershey characters are all decked out in their winter weather garb to keep them warm. This makes a great photo opportunity for your Christmas card! The kids and I love to play the games when we have time. If you are a season pass holder, you can get game tickets 1/2 off at Hospitality Services right inside the park on the right as you go up the hill. Some of the games have branded prizes, and they make great souvenirs! This cute ornament not only says Hersheypark, but it also includes “Christmas Candylane” making it a great souvenir option! I suppose that you could say that Chocolate World is technically outside Hersheypark, but it is right there. 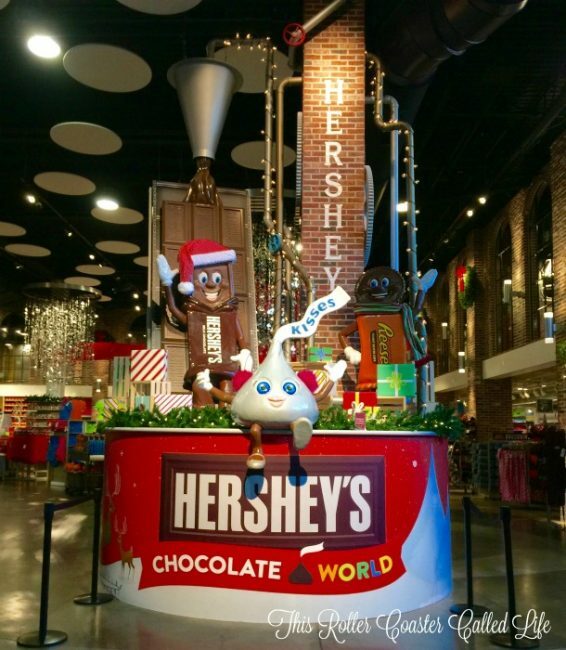 It is an easy walk right outside the park gates to ride the Hershey’s Chocolate Tour ride, nab a great photo opportunity, and check out all the chocolate there. 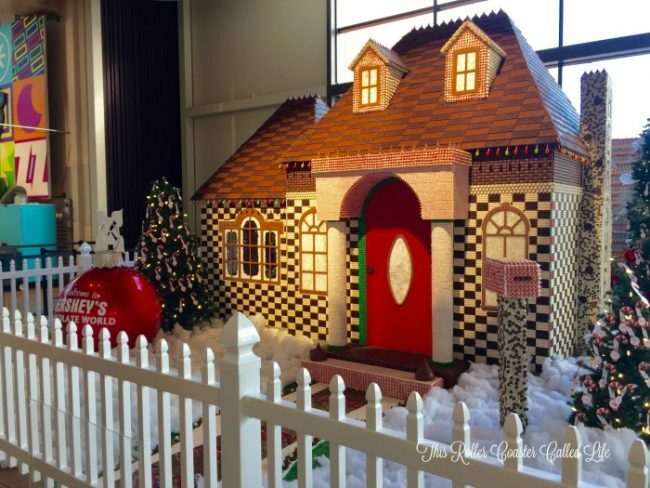 As Chocolate World is inside, it is a great option to walk to (just remember to get your hand stamped going out of the park) and see the Chocolate House. We enjoy looking at the Chocolate House and trying to figure out how many different kinds of Hershey’s candy was used to make this house. Make sure to look at the walkway! 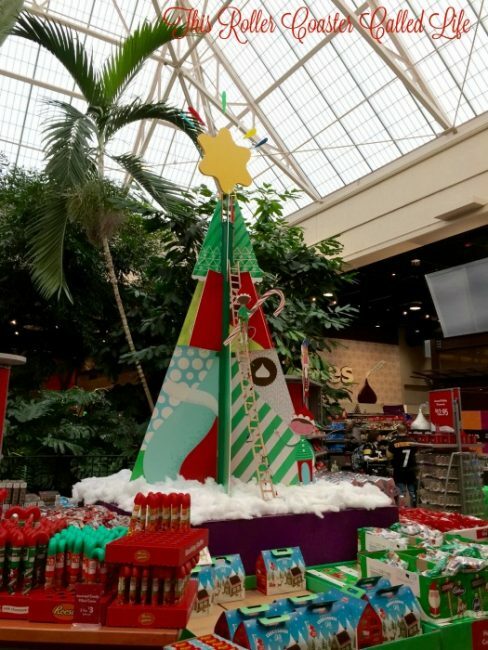 Chocolate World is also a great place to pick up those candy and chocolate stocking stuffers that every one of Santa’s helpers (mom and dad) need on Christmas Eve! There are so many things to see and do at Hersheypark over the holiday season! Make sure to check out the Hersheypark hours when planning your trip there through the holidays. Are you looking for the perfect stocking stuffer? 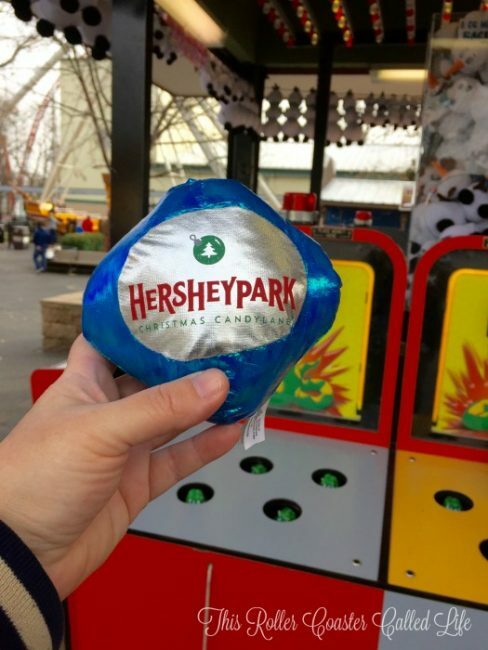 A 2017 Hersheypark Season Pass would fit nicely in anyone’s stocking! Disclosure: I am a member of the Sweetest Moms and as such have received compensation for this post. All opinions are my own! 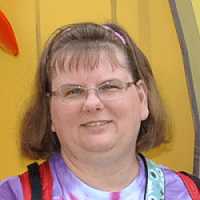 Remember, I wouldn’t buy my family season passes to Hersheypark unless we really liked it! As I haven’t been to Hershey Park in a very long time things have changed so much and of course for the better. I would fall in love with NOEL and the Christmas carousel music! I love everything about the Christmas Season the lights, music, decorating, wrapping, the way people come together. I love this time of the year!! I love looking at all the Christmas lights. How beautiful and I bet it is quite the experience! I’d love to head to PA someday soon for the holidays which has been years. 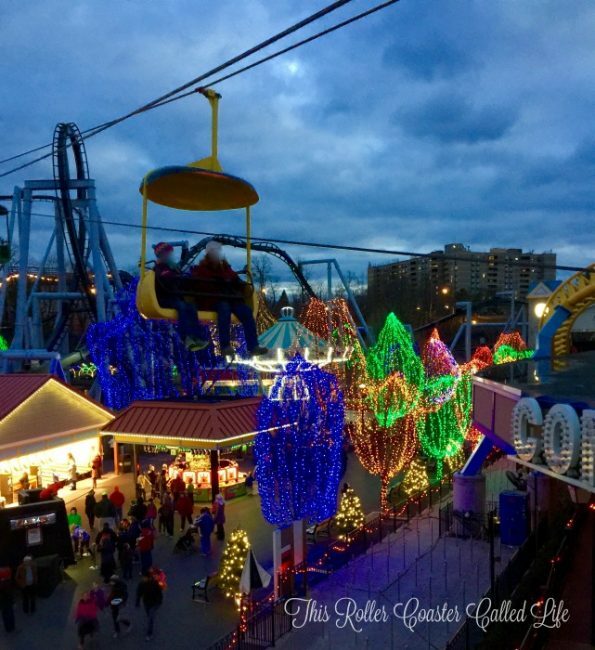 PA is beautiful in the winter and Hershey Park seems to get the holidays right! I love that you have a picture of my favourite carnival game – Whack a Mole!!! Hersheypark-I’ve never been there but would sure like to go! It looks like so much fun–even though I don’t have any kids to take along.